Recently I was in the kitchen and noticed a couple of what looked like lint or crumbs on the ground. Upon more careful inspection, I had a feeling they were droppings left there from some small animal like a mouse. A quick search on the internet confirmed my suspicions that it was indeed from an mouse. This was surprising because I have lived in the same place for years and this was the first time there has been any evidence of mice. So I cleaned up the floor and went in search of where they may be getting in. Apparently they can squeeze in through small holes and cracks that appear to be too small for them to get through. I noticed the droppings were near the stove so I thought they might be getting in from around this area. I slowly pulled the stove out away from the wall and saw that the baseboard section was unfinished so there was space open between the floor and the wall where they may have gotten in. I had some spackle on hand so I sealed up all the openings along the base board. I also checked around the cabinets and taped up any other openings that might allow mice or bugs to get in. So far it has been a few days and it looks like the problem has been fixed! There has been no further evidence of mice so it looks like they were getting in from behind the stove where there was the opening at the base board. 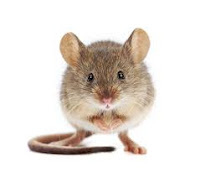 If you have found what look like little black crumbs the size of a grain of rice, chances are you may have mice. If this is the case, make sure to check all around for any openings around the walls and seal up any holes where they may be getting in. I will update this post in case there is any evidence of a return.